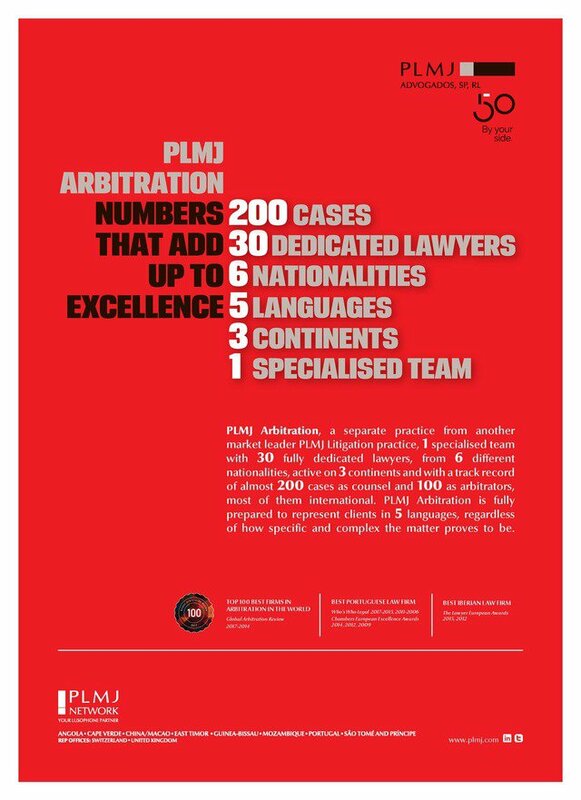 PLMJ was founded in the late 1960s and now reckons to be Portugal’s largest law firm. It took on its first arbitration in 1979 and has handled more than 150 such cases since. It has the distinction of being the first firm in the country to have appeared as counsel in an ICSID. The team was previously co-led by founding partner José Miguel Júdice, one of the country’s few internationally recognised arbitrators, and Pedro Metello de Nápoles. In 2018, Júdice stepped down from his leadership role, although he remains a partner in the team. Júdice is a former member of the ICC Court, is on the arbitrator lists of ICSID, the Permanent Court of Arbitration in The Hague, and other institutions in Brazil, Portugal, Spain, Mozambique and Korea. He’s also president of the Portuguese Chamber of Commerce’s Arbitration Centre, a board member of the Spanish Arbitration Club, and a former board member of the Portuguese Arbitration Association. Most of the team is based in Lisbon and Oporto, but the wider firm has offices or joint ventures in several other Portuguese cities. In addition, it has built up a network of associated firms in Portuguese-speaking countries, of which the most significant for arbitration purposes are Mozambique, Angola and Brazil. Portuguese construction companies feature heavily on the client list, often in connection with overseas infrastructure projects. But the firm has international clients too: it has acted for Getma (a unit of French logistics group NCT Necotrans) in a multifront dispute with Guinea; Irish building materials group CRH in an ICC matter; and Brazilian piping company Asperbras. The firm also acts for states and previously defended Mozambique against a US$450 million claim brought by the former holder of a public infrastructure concession. In 2014, the firm helped Getma win an award for more than €38 million against Guinea in a contractual dispute over a cancelled port concession in Conakry. The case was heard under the rules of OHADA, a pan-African institution based in Ivory Coast. However, the award has since been set aside by an OHADA court because of a controversy over the arbitrator fees, and was denied enforcement in the US. A parallel ICSID claim was largely dismissed in 2016. PLMJ obtained a good result in 2011 for CRH as respondent in an ICC case brought by Portuguese conglomerate Semapa (represented by Freshfields) over a call option for shares in a joint venture. Although the tribunal ordered CRH to sell its stake in the venture to Semapa, it rejected the claimant’s demand for a 10% discount on the share price as well as a damages claim for US$100 million. The award was upheld at two instances in the French courts. Dutch client Visser & Smit Hanab, a pipeline builder, saw all but 2% of a US$21 million claim against it dismissed by an ICC tribunal, while winning almost half of its claimed damages in a counterclaim. PLMJ has been acting as co-counsel with Spain’s Uria Menendez for Vitadel, a company owned by Isabel dos Santos, the billionaire daughter of Angola’s former president. The firms defended the company as one of the respondents in a US$3 billion ICC case brought by subsidiaries of Brazil’s Oi under a shareholders’ agreement for Angolan mobile carrier Unitel. The arbitration, which was heard by the ICC’s first ever five-person tribunal, resulted in an award in February 2019 requiring the three respondents to pay US$650 million, while dismissing much larger claims worth more than US$2 billion. PLMJ and Uria replaced Quinn Emanuel on the case in 2015. PLMJ is representing another company linked to dos Santos in a US$850 million claim against Angola under a port concession agreement that was never signed. The ICC recently refused to administer the dispute, meaning it will proceed as an ad hoc claim. Banco BIC, another entity in which dos Santos has a stake, continues to use the firm in two arbitrations with Portugal concerning another bank’s privatisation. IKEA Group, a regular PLMJ client, is currently using the firm in a dispute over the construction of a shopping centre. The firm continues to act for Oxy Capital, a leading Portuguese private equity fund, in two shareholder disputes: one regarding the recognition of a call option right and the other relating to a contractual pricing mechanism for shares. The firm promoted Mariana França Gouveia to partner and Filipa Cansado Carvalho to of counsel. Oxy Capital’s Miguel Lucas says the firm’s work on the cases mentioned above has been “outstanding”. Paulo Marinho, legal counsel to Portuguese road developer Ascendi, tells GAR that PLMJ’s work is characterised by the team’s “interest, keenness and availability”. Margarida Novais, legal counsel at Portuguese construction company CME, says that the PLMJ team displayed a calm demeanour when faced with the opposing side’s “aggressive and intimidating” approach.